You rely a lot on your ears when doing bird surveys, especially in the summertime. Thick foliage obstructs views, females are tending nests or young, and unless they are singing from an exposed perch, males may be hard to locate as well. Listening carefully for songs or call notes usually allows a patient observer to verify an identification, or recognize a behavior that provides confirmation of nesting (in my case, for a state breeding bird atlas project). Yellow-billed Cuckoos (Coccyzus americanus) are forest ghosts, detectable by their guttural, hollow, just-downright-strange call: ka-ka-ka-ka-kow-kow-kow-kow-kowlp-kowlp. It’s hard to tell if they are near or far. There sure seem to be a lot of them around this year. I think this may be because they had a bumper year for reproduction in 2004 due to the emergence of Brood X of the periodical cicada in this region. Cuckoos specialize in large insect prey (and hairy caterpillars like tent caterpillars and gypsy moths), responding to an abundant supply by laying more eggs. They are not obligate brood parasites like Old World cuckoos. Usually, they raise their own young, but sometimes lay their eggs in the nests of other cuckoos, and occasionally other species. Prey abundance may trigger this behavior. Sometimes. Or not. This is a bird that doesn’t easily give up its secrets. When they know they are being observed, Yellow-billed Cuckoos tend to stop moving and arch their backs to conceal their white underparts. I have a lot of territory to cover doing my atlas work, so I have yet to even spend the time really trying to see a cuckoo, much less find a nest. But bursting baby feathers! Next time I hear the wooden notes of the Rain Crow, somewhere in the woods, I may try to stalk this skulking bird. Or at least listen for a quiet series of little explosions, the repercussions of popping plumage. *Pin feathers look kind of like aglets, which are the things at the ends of shoelaces. Somehow, just knowing about the popcorn pin feathers makes it even nicer knowing they're out there, though I've not seen one in years. We have quite a few this year, as I would have predicted when our wild cherry trees began to show the tissue of webs in all the crotches in mid-spring. Thanks for this post on one of our favorite birds. Amazingly, due to my poor talents identifying birds by sound, and the good fortune to have yellow-billed cuckoos resident in the area around my house, I have spotted these birds more often than I have heard them. My wife decided to get proactive: she put the bird in a small, open box and move it onto a shaded part of the roof, so it wouldn't roast in the sun. We then went inside and she called a friend of ours who studies birds professionally to ask him for advice. By the time we went back to the roof, the bird had left the box and was just sitting on a branch in an oak tree a few feet away. We watched it for about twenty minutes, during which it moved only a couple times. But we were glad to see that it was clearly going to recover without further help from us. We've since put up a paper hawk silhouette on that window to prevent any more bird collisions. And it's working so far. And we still see yellow-billed cuckoos with regularity. Perhaps even this same bird, for all we know. My wife, who is obviously more talented at bird-watching than I am, can now identify them in flight. Cuckcoos are one of my favorite birds, too. I learned to identify them long ago but they are elusive and the average person really doesn't know what they look like. However the Rain Crow's call is familiar to most people because the birds are numerous in this area. By my observation over several decades, this has proven to be relatively accurate here in Central Texas; not always, but generally. What I have observed it that their calls seem to increase with increasing levels of relative humidity. Part of that may be that their most active period is in the spring and early summer when we have our wettest months: May and June. I've always wondered if there is some tangible relationship concerning that piece folklore. The other piece of folklore is that it is extremely bad luck to kill a Rain Crow. That may well have stemmed from the cultural relationship with rain in an area quite prone to drought. I've seen quite a few killed on the local highways; they have a bad habit of swooping low through traffic. I am sure that a pair of YBC's are nesting high in a wild cherry tree in the fence row along our pasture (Tallahassee, FL). 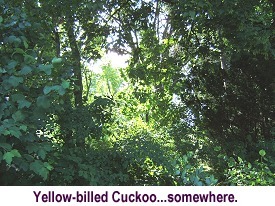 We hear a cuckoo frequently up there, but have yet to see one. Is a whipper whill and a rain crow the same bird? No, a Whippoorwill is in the nightjar family, and a a rain crow, in this post, is a cuckoo. Not even closely related. yellow billed cuckoo. Definitely an attractive bird, regardless of its name.